Manchester United fans abandoning their ‘doesn’t matter how we win titles’ philosophy sums up how desperately mundane Jose Mourinho’s approach was on Saturday. A frightened setup from Premier League title contenders made for a familiar tale at Anfield as Liverpool were frustrated by a team of eleven defenders. The gloriously toothless United display was of stark comparison to the Klopp-inspired exuberance and energy that is edging closer to reigniting the Reds’ season. King Kenny Dalglish stamped his own legendary mark on English football’s biggest fixture. Home became a fortress. Liverpool teased yet more signs of re-erupting and compensating for a bulk of excruciating weeks. Boring, boring Mourinho became the beacon of reassurance Reds needed. The reminder that Liverpool’s red arrows remain a threat to all, an attacking force not to be taken lightly, a ticking time bomb ready to inflict a long overdue battering. In an challenging period for the club, the challenge and the reason for the challenge was beginning to go overlooked. Liverpool’s Brazilians, Liverpool’s flying wingers, Liverpool’s all-action midfielders have given teams reason to be afraid, reason to not over-commit. It’s been for an uncharacteristic lack of conviction and a spell of misfortune that opposition sides are managing to enjoy some luck against the Reds. The wasted opportunities have been stacking up, the irritation has been building up, but, after Saturday, so is the confidence again. Sooner or later, Liverpool are dishing out a merciless lesson. It’s just a matter of when and who. They did break down Mourinho’s bus, only to be foiled by the world’s best bus driver David De Gea and an exhibition of shoddy finishing- in keeping with the current trend. A belief that things will spark back into life has been rightly restored. Imagine if Liverpool had a prolific No.9 at their disposal. Imagine. Reds will have imagined it, and felt bad for doing so out of loyalty to such a popular figure like Roberto Firmino, whose illusive attacking excellence is appreciated by all. The loose balls in the opposition box, the rebounds and the crosses void of perfect accuracy and shape would all be put to good use. In ruthless fashion, too. With a clinical front-man, Liverpool cruise to three points on Saturday and, most likely, three points against Newcastle, against Spartak Moswcow, against Sevilla. Adding an option in the mould of a Harry Kane, a Romelu Lukaku or an Alvaro Morata wouldn’t diminish Firmino’s value or role on Merseyside, but instead gift Klopp’s attacking imagination another angle to chip away at. Bright but unrewarded Liverpool performances don’t go unrewarded with someone focused on little other than putting the ball in the back of the net. To be successful in England’s top flight, you can’t help but feel a 25 goals-a-season man is what is required. Of course, it can be argued that Liverpool’s combined attacking setup is capable of replicating that, but how often are they all fit at the same time? Mourinho was slammed for dusting off his double-decker and rightly so. If he goes on to win the title, though, why would he care? It takes serious defensive discipline to sit deep and shutout Liverpool for 90 minutes and, from one perspective, dedication to seeing out such a task deserves credit. Endorsing the kind of display San Marino produce against Germany would be an insult to everything Klopp has implemented on Merseyside, but there is certainly a lot the Reds can learn from the weekend. The fact Liverpool managed the game perhaps too sensibly is something to take forward. With Philippe Coutinho’s vision and creativity, Mohamed Salah’s pace and directness and Firmino’s link-up play and movement, the Reds have three dimensions in every attack. Add that to the power of Emre Can bursting from deep and the combination play Georginio Wijnaldum injects, five players are more than capable of producing the goods. Liverpool don’t need to commit half the team on every attack, nor does at least one full-back have to join in at any one time. 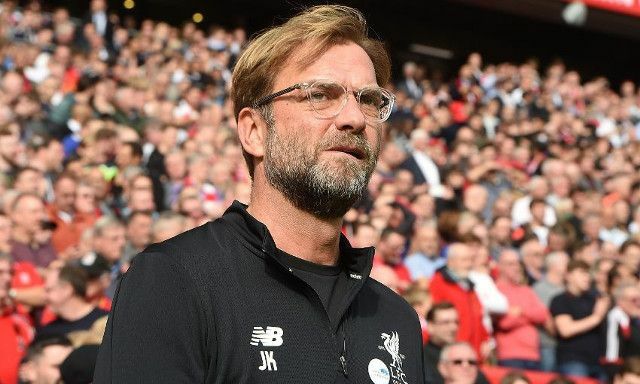 Whilst the Reds pushed hard for the win on Saturday, they also, the manager included, showed a reluctance to take the next risk in favour of preserving a solid and more balanced structure. Klopp’s men didn’t press as high as they have in the past, and that, though easy to overlook, is a step forward. For those claiming Mourinho cancelled out Klopp, well Klopp did exactly the same in response. The counterattacking threat was completely nullified. Mourinho’s safety net plan of action would never work at Liverpool, but the discipline and wise decision-making it involves is something the Reds would do well to pick up on. Just for the record, busses are not permitted to park on Anfield.